Civil shipboard-maritime version of the Kamov Ka-32 developed in 1981. The aircraft is fitted with radar, and electric load hoist, and added external fuel tanks. Common uses of the aircraft include ice patrol, ship guidance through icefields, moving up to 360000 kg of load a day (with a payload capacity of 5000 kg), and SAR. Known for its semi-automatic flight modes, the helicopter can operate in day or night. 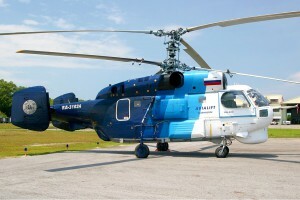 The Ka-32S prototype first flew in 1983. The series entered production in 1987. Overall Dimensions with folded main rotor. Resources related to the Ka-32S , provided by the Vertical Flight Society. Resources related to the Ka-32S , provided by public sources across the internet.